Twenty-six members of the National Assembly were selected by the Sunfull SNS Youth Monitors to receive Sunfull National Assembly Awards at the Assembly Members’ Office Building on Wednesday. The Sunfull Foundation, founded in 2007, honors National Assemblymen deemed to have used positive language during plenary sessions. 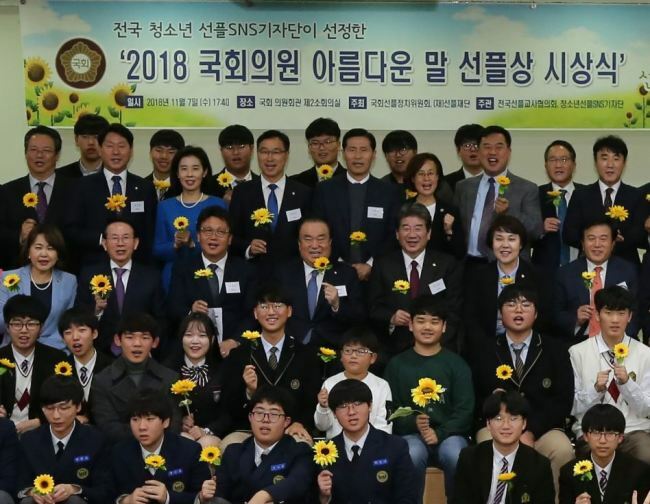 The Sunfull SNS Youth Monitors -- a group consisting of 297 national high school and university students -- delivered award plaques to the 26 awardees. The awardees were picked through a selective process after close monitoring and analysis of their speeches recorded in the official National Assembly meeting log. The Sunfull Grand Prize was awarded to four National Assembly members: Moon Hee-sang, Choi Woon-youl, Lee Myoung-su and Park Sun-sook. The Sunfull General Prize was awarded to 22 members: Kang Seok-ho, Kyeong Dae-soo, Kwon Mi-hyuk, Kwon Eun-hee, Kim Young-joo, Kim Jong-dae, Park Kyung-mee, Park Soon-ja, Park Wan-su, Song Eon-seog, Song Hee-kgyoung, Shin Yong-hyeon, Shim Ki-joon, Ahn Gyu-back, Wi Seong-gon, Yoo Jae-jung, Yoon Young-il, Lee Jin-bok, Lee Hack-young, Jeon Hyun-heui, Jeong In-hwa, and Jung Choun-sook. “If we all use words of encouragement and support in our daily lives, our society will be overflowing with positivity, which can reduce a substantial amount of social conflict costs,” said Assemblyman Min Byung-doo. 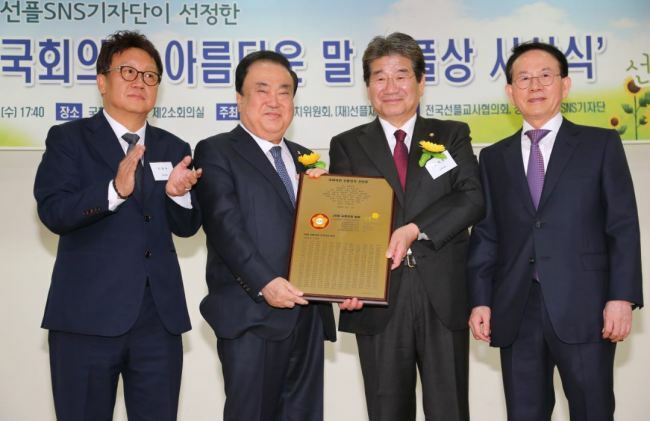 After the awards ceremony, Min and Kang Seok-ho, the co-chairs of the Sunfull National Assembly Political Committee, and Min Byoung-chul delivered the Sunfull plaque to the speaker of the house. The plaque had inscriptions of 297 names of the currently 299-member National Assembly who have signed the Sunfull pledge. In a bid to spread positive energy and reduce social conflicts, 47 members of the National Assembly, including Shim Jae-kwon, Shin Sang-jin and You-Sung-yop, proposed an amendment to the Act on the Promotion of Information Network and Information Protection on Feb. 10, 2017. The proposal would designate a “Sunfull Day” in order to promote healthy internet communities and is currently waiting to be examined by the assembly’s Science, ICT, Broadcasting and Communications Committee.